When our team returned home from Victoria, Canada, after hosting An Occasion for Tea, they brought me a little surprise gift from Ivana Smulik. When I opened the cellophane wrapping, I found the most intricate cookie I have ever seen. I contacted Ivana asking if I could share this work of art on The Ribbon In My Journal. She graciously said that I could share this with you. She made the heart-shaped cookies for our staff as a thank you for a glorious weekend of beautiful teas and wonderful speakers. 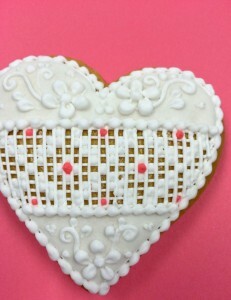 If you look close at the tiny treat, you will notice that it is iced to look like embroidery with lace. The tiny lines of the “fabric” are perfectly straight and so small I could hardly see them. Each flower is so precise that you could mistake it for embroidery. I love when a woman uses her talent to bring happiness to others. 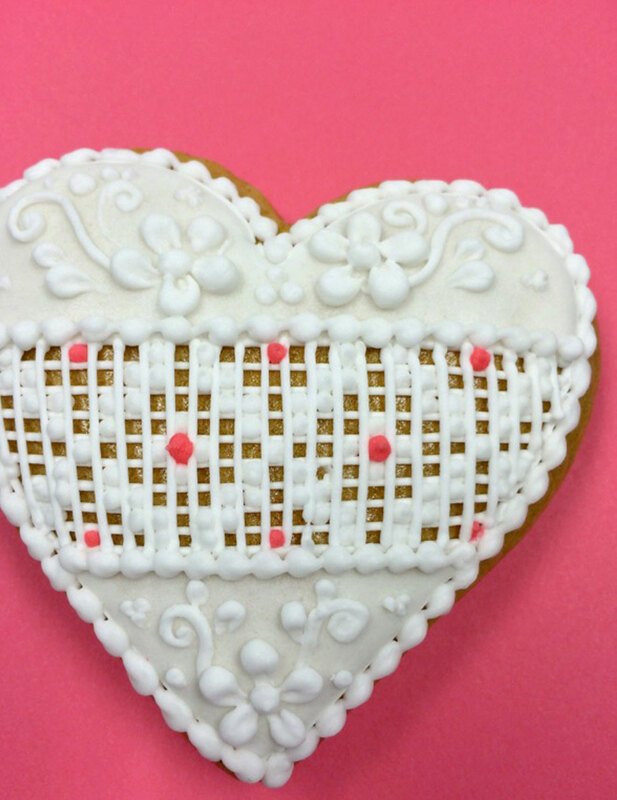 The little cookie is still sitting on my desk—it was too pretty to eat! It actually is a delicious honey cookie that will melt in your mouth, according to my staff. 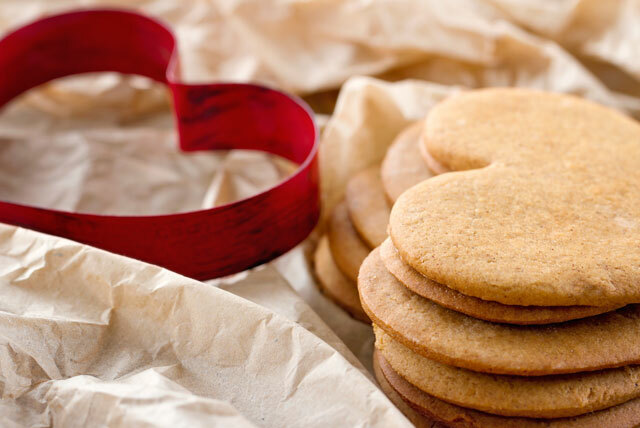 Ivana lives in Canada and makes these cookies in many shapes and holiday themes. Thank you Ivana for allowing me to feature your lovely work. If you have a wonderful artisan that our friends on The Ribbon In My Journal would love to read about, please post about it in the comments, or send the information and photos to me here. 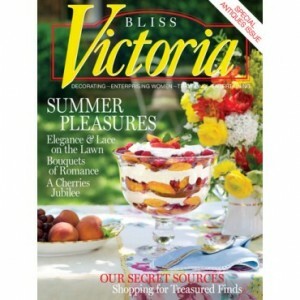 Subscribe to Victoria magazine today! So Pretty!!!! I have a friend Teresa McEvoy that makes the MOST AMAZING cookies! They are not only EXQUISITE, GORGEOUS, and UNIQUE but they are also EXTREMELY DELECTABLE!!! You can find her on Facebook at Sweet-T-cakeS in Fontana,CA. You won’t be disappointed! In fact you will be delighted!!!! With Heartfelt Thanks for imprinting your beauty on our hearts and in our homes!!!! That cookie is gorgeous. I would take a picture of it and then savor every crumb of that cookie! I would love to see her as she decorates the cookies. If you can’t bear to eat them, buy them and preserve them as a Christmas ornament and give as gifts. That is a lovely treat. Far from Canada, in Texas, if you drive down Highway 6, between Waco and Bryan/College Station, there is a quaint little Victorian town. Highway 6 , Main Street, runs through it. South of the traffic light, in one of the old buildings, you will find Zamykal Kolache shop. Jody, the owner, makes wonderful gourmet kolaches from her grandmother’s recipe, and some other treats, as well. On the side, Jody likes to design and make Victorian outfits. She is quite a fun and lively lady. On the north end of the traffic light, CocoModa can be found in an old bank building. They have gourmet type of food, too, but the feature is all kinds of chocolate. They even have chocolate sculptures! Just down the street, they have their own chocolate factory that is open for tours. A cozy place for a pot of hot chocolate in cold weather and they have a cooling chocolate drink in the hot Texas weather. The owner is a delight to meet. In the next block. there is a potter in an old dry goods store. He has a huge outdoor kiln and arbor area, with piped in music for relaxing beside the store. Besides his own creation, he is set up for classes, etc. Very creative man. Each fall, thee is a Victorian Tea in the afternoon, on the lawn of one of the old homes. That evening, there is a Gala or Ball with Victorian dress. Along with food, music, etc., they have had artists at the location to paint the Tea and Gala. Interesting event and setting. Pretty little town dating back to 1868. Worth a ride around to see the old homes and churches, the old park with bandstand and gazebos, or even stay in one of the B&Bs. I will probably never get to Canada for a lace cookie, but I can enjoy a Czech style kolache or chocolate in nearby Calvert, Texas. Thanks for sharing, Cecilia! I live in The Woodlands, north of Houston, and I didn’t know about Zamykal Kolache shop or CocoModa. Now I’ll make it a point to visit Calvert! I would love to have some of these on my cookie tray but I would have a hard time eating them, they are so beautiful. I had the pleasure of attending An Occasion for Tea and met Ivana. She is as lovely as her cookies. Not only did she share cookies with the staff but also the conference attendees. The amount of work she put into the cookies I’m sure was immense and all for the sole pleasure it gave her. What a truly gracious lady she was. We were all truly blessed to have spent time with her. What a gorgeous cookie! We are visiting Victoria, Canada in August, and I’d like to enjoy this cookie and a cup of tea while I am there. Thank you for sharing! 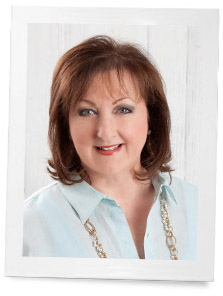 Phyllis, you should feature jewelry designer Cynthia Bloom in Victoria. She creates amazing necklaces from antique Czech beads and buttons. It is wearable art! You can read my recent interview with Cynthia and see her video at http://www.staceysjournal.com. She is perfect for Victoria Magazine! So very lovely! Thank you for sharing! Deliciously delightful! Hearts of happiness for all! The older I get, the more I appreciate such “art”! Gorgeous! hello Peggy. I just found your blog, I am enjoying it. I wish my grandmother could have seen this lovely cookie. Absolutely a work of art! What a delight to look at! Thank you for sharing with us. Beautiful work! What a treasured treat! Oh Phyllis, how awe inspiring. Thank you for sharing this lovely work of art. The talent and creativity of others is so amazing to me!!! Ivana is a true artist! The cookie is so beautiful but I have to admit that it does make me want to take a bite and savor the flavor.